Orleans: Neue Ortskarten N°1 ("Place Tiles N°1") is a mini expansion for Orléans that consists of three new place tiles: Bakery, Goldsmith, and Lair. Orleans: Neue Ortskarten N°3 ("Place Tiles N°3") is a mini expansion for Orléans that consists of three new place tiles: Port, Quarry, and Workshop (Hafen, Steinbruch, und Werkstatt). Carcassonne: Over Hill and Dale , a standalone game in the Carcassonne series, allows players to be farmers who care for animals on their large farms and cultivate the fruits and vegetables in their fields. 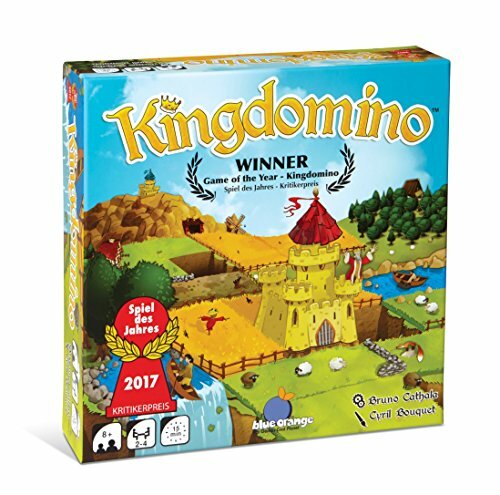 Description from the Z-Man English version product page: They say agriculture is the most noble employment of man, and Carcassonne: Over Hill and Dale wanted to offer players the gratifying feeling of providing for the people. In this new game, towns and castles make room for fields of fruits and vegetables. Collect them all, build stables to house animals, and walk down a hill to make even more points! The ability to walk a meeple down a path and score more points. A new setting to enjoy the new mechanic of Carcassonne. The King is dead! What happened? Nobody really knows, but he was found face down in a wine barrel this morning. It could have been either foul play or his own thirst that did him in. Regardless, the King is dead without any known heirs, so it's up to the five factions of the realm to decide who will be the new king: Will it be you or your opponent? Do you have what it takes to win over the realm's factions? Claim 2 is played in two distinct phases. In phase one, each player gets a hand of cards that they use to recruit followers. In phase two, they use the followers from phase one to compete and win over the five factions of the realms. Each faction has a special power that effects play, and powers can be different in each phase! At the end of the game, the player who has the majority of followers of a faction wins that faction's vote, and whoever wins the vote of at least three factions wins the game! Claim 2 is a standalone sequel to Claim , featuring five new factions that can be played on their own or mixed in any combination with the factions in Claim . Qwixx: Big Points is an expansion for Qwixx that consists of two 80-page scorepads that provide a new way to score big points. Each scoresheet adds two new rows to the four rows on the original scoresheet: a red/yellow row between the red and yellow rows and a green/blue row between the green and blue rows. While playing the game, if you've crossed out, say, the red 5 and you're presented with a red 5 later in the game (whether through your roll or an opponent's roll), you can cross out the red/yellow 5. As in the original game, you can't cross out a number to the left of a crossed-out number, so once you've crossed out the red/yellow 5, you can't cross out the red/yellow 2, 3 or 4. The game still ends when a second row has been completed or when one player has failed to cross off anything for the fourth time. Players then score their four single-colored rows, with the Xs in the dual-colored rows adding to the total number of Xs in both of those colored rows. Whoever has the highest score wins! Orleans: Neue Ortskarten N°4 ("Place Tiles N°4") is a mini expansion for Orléans that consists of three new place tiles: Bourgeois House, Lock, and Observatory (Bürgerhaus, Schleuse, und Sternwarte). Each player in Twenty One receives a different score sheet at the start of the game; each sheet has five horizontal rows with six colored dice pictured in each row, and while the numbers are identical in each of the rows on each sheet, the arrangement of colors differs. To score points, a player needs to fill these dice with numbers, but they have to fill (or mark off) all six dice in a row before they can move to the next row on their score sheet — and to write numbers on their sheet, they'll have to depend (at least somewhat) on the luck of the dice. On a turn, the active player rolls six colored dice that match the colors depicted on each score sheet. They must keep all 1s that they roll, but they can choose to reroll all non-1 dice twice. After the second roll, all players can use the rolled dice to fill one or more of the dice on their sheet — but only if the die of the matching color shows a value equal to or less than what's on the score sheet. For example, if your row shows a yellow 6, blue 5, white 4, etc., and you or the active player rolls yellow 3, blue 6, white 4, etc., you can choose to write "3" in the yellow space (earning yourself 3 points at the end of the game), but you may choose not to since you could score up to 6 points for that space. You can't write anything in blue since the die is higher than the number shown. You definitely want to write 4 in the white space since 4 is the most points you can score there. What's more, since you had an exact hit, you "x" the box as well, and you score bonus points in a row for the number of "x"s that you have. If you can't or don't want to fill in a number, you must cross out the leftmost space in your current row, earning no points for this space. As soon as all spaces in a row are filled or crossed off, you start the next row with the next roll of the dice. The game ends the turn that someone completes the fifth row, after which everyone tallies their points to see who wins. Panic Station: Parasite Control is a mini-expansion for Panic Station that consists of exactly two new cards for the item deck: Parasite Radar – Players can use this to reroll the die for parasite movement, making it a great tool for both humans and infected players. Heavy Grenade – With more potential power, a heavy grenade can possibly cause more damage than usual, even to adjacent rooms. 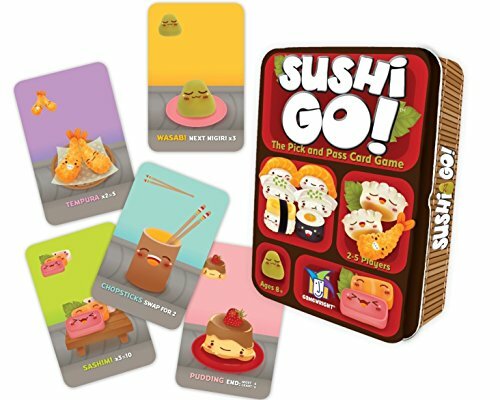 A mini expansion for Sushi Go! includes four copies of a new "Soy Sauce" card that will score four points to the player who collects the most variety of colors in a round. The Soy Sauce promo is contained in the 2016 release of Sushi Go Party. Renaissance Europe is coming together, and people have realized that even the most powerful dynasties can achieve more together, so members of those dynasties are marrying, trading and sharing with one another — but who will end with the biggest piece of the pie? In Dynasties , players must make many compromises, whether acting on their own or reacting to the behavior of their fellow players. In addition to these tactical and strategic decisions, luck also plays something of a role as not every marriage brings the windfall expected. Perhaps then another marriage will bring more success and influence? Strange noises are heard from the Mad Mansion of Doctor Doom. Clouds of all colors come out of the chimney, and people tell weird stories about crazy creatures seen in the forest around the mansion. Help Doctor Doom finish his extravagant experiments to create the world's wackiest and craziest creatures ever seen! In Crazy Creatures of Dr. Doom (a.k.a. Dr. Gloom in the U.S. release), all players try to get rid of their cards as cards in hand score penalty points at the end of a round. The player with the fewest penalty points at the end of the game wins and becomes Doctor Doom's new apprentice! Players in The Game try to discard all 98 cards in the deck onto four discard piles in order to win, but they need to do so in the right ways. Each player starts with 6-8 cards in hand depending on the number of players, and four discard pile prompt cards are on the table: two showing "1" and an up arrow and two showing "100" and a down arrow. On a turn, a player must discard at least two cards from hand onto one or more discard piles, with cards on the 1 piles being placed in ascending order and cards on the 100 piles being placed in descending order. One tricky aspect to play is that you can play a card exactly 10 higher/lower than the top card of a discard pile even when you would normally have to play in a descending/ascending order, e.g., if a 100 discard pile is topped with an 87, you can play any card lower than 87 or you can play the 97. After a player finishes their turn, they refill their hand from the deck. During play, players cannot reveal exact numbers in their hands, but they can warn others not to play on certain discard piles or otherwise make play suggestions. Once the deck is emptied, players are required only to play at least one card on a turn. If you play all 98 cards, you win! If you get good, the rules suggest that you play at least three cards a turn to increase the challenge. The German NSV edition of The Game on Fire is a special version of The Game packaged in a tin with a playmat and an "On Fire" mini-expansion. This expansion consists of six flaming cards (22, 33, 44, 55, 66, 77) that replace the regular cards, and when one of these fire cards is played onto a pile, that card must be covered by the end of the next player's turn or else players have lost the game. The U.S. edition of The Game on Fire will have the six flaming cards in the box in place of the other cards, and it won't contain the playmat. Lanterns: The Harvest Festival – Promo Tiles are four additional tiles for use in Lanterns: The Harvest Festival . The tiles provide more aesthetic variation in the platform artwork. Before you add all four new tiles to the game, you are encouraged to first remove one tile of each platform type from the base game. It is one of the Earth's most breathtaking natural spectacles! Every year millions of gnus, zebras and antelopes pass the Mara River in Africa. Water means life — but it also holds danger as crocodiles and lions lie in wait. What luck that there are tembos (elephants) who will help the animals to get safely to the other shore. Tembo is an awesome game, as exciting and wonderful as Africa itself! Is she drawing an elk or a moose? Is he drawing a pegasus or a unicorn? These are the types of questions you will probably be asking yourself during a game of Pictomania ! There's no time to draw a complex masterpiece in Pictomania , the drawing game in which everybody draws and everybody guesses — all at the same time! Players sketch the essence of the word with a few quick lines and try to guess the others' drawings while there's still time. This second edition of Pictomania features revised word cards with a brand new look. One big change for this edition compared to the base game is that only three word cards are in play no matter the player count, allowing you to jump into each round more quickly since you don't have to read as many words to guess who might be drawing what. The competition of the builders continues in Imhotep: Das Duell ! In this game, players take on the roles of Nefertiti and Akhenaten, one of Egypt's most famous royal couples. Game pieces must be cleverly placed so that players can unload the most valuable tiles from the six boats. While this is happening, each player builds their own four monuments in order to gain as many fame points as possible. The Rattus promocard The Jester was especially developed for Boardgamegeek by designers Åse and Henrik Berg. The card was published by Dutch board game publisher White Goblin Games. The card even stars Ernie, the mascot of Boardgamegeek. During the Middle Ages, it was the jester’s task to entertain the people. So there’s an obvious link between this card, the game and Boardgamegeek. Besides that, a jester is a funny and strange guy so this card also lets you do something funny and strange: The player who has the jester, is allowed to take 2 cubes from his supply in hands and drop them on the board from about 30 to 40 cm height. Where the cubes end, they will settle. The card can be combined with the base game, as well as with each and every expansion. This card is a Boardgamegeek exclusive and will only be available from the Boardgamegeek store. Norenberc: Bonus Townsmen is an expansion for Norenberc that was originally available to early adopters at Essen 2010. It consists of eight additional townsmen, which have a red background to distinguish them from those in the base game. They are shuffled into the starting deck before any townsmen are returned to the box. The bonus townsmen are two "Bankers," two "Jack-of-all-trades," one "Historian," one "Merchant," one "Haggler," and one "Duchess." A solo campaign for the 2014 game "Orléans" - you have to travel to Tours and deliver three Citizen Tiles and three tiles of every good. A Dutch version of this expansion is contained in Orléans (Dutch edition). With Rattus: Academicus , an expansion for the Rattus base game, you can upgrade the base characters to make their actions even more powerful! The added universities and event cards provide even more diversity to the game. 1348, Europe – The Black Death ravages Europe, and your country still has no king after the last one was killed by the plague. The nobility of the land has had enough of you princes never being able to settle for an heir for the country. Therefore, the nobles have begun to interfere with your disputes. On your visits to the various buildings, it may now occur that you meet a noble with a political agenda of his own. In some cases, he welcomes you and helps you in your quest, while in other cases he tries to make life as difficult as possible for you. Will you be able to keep the nobles at your side in your struggles against the other princes so that at last a new, worthy king can be elected? Rattus Cartus: Nobilis , the first expansion for Rattus Cartus (a card game based on the Rattus board game) includes 18 different buildings with players using all or only some of them each game to provide a wide variety of play. This first expansion also includes special cards (Books, Horses, Lances, Privilegs, Wizard Staffs and Diplomats) and extra rat tokens; a second module in this expansion includes noble tokens. Rules: The player holding this card may, at the end of phase C, move one of his cubes to the palace area if at least one other player’s cube is killed by the Plague. The cube must be taken from a region adjacent to the region where the rat tokens are revealed (it doesn’t matter whether this region contains rat tokens or not). End of the game: The player may move the Plague Piece one step in the final counterclockwise round. If the Plague kills another player’s cube in this region he can save one of his own cubes from a neighboring region. Card combinations: If a player also holds a card depending on plague piece (Chivalry characters or Serf), he must apply the effects of these cards in the same region. Released in october 2014. Contains: St. Francis of Assisi: was an Italian Catholic friar and preacher. He founded the men's Order of Friars Minor, the women’s Order of St. Clare, and the Third Order of Saint Francis for men and women not able to live the lives of itinerant preachers, followed by the early members of the Order of Friars Minor, or the monastic lives of the Poor Clares. Though he was never ordained to the Catholic priesthood, Francis is one of the most venerated religious figures in history. Barbarossa: Holy Roman Emperor, he got the name Barbarossa from the northern Italian cities he attempted to rule: Barbarossa means "red beard" in Italian. In German, he was known as Kaiser Rotbart, which has the same meaning. Genghis Khan: was the founder and Great Khan (emperor) of the Mongol Empire, which became the largest contiguous empire in history after his demise. Marco Polo: was an Italian merchant traveller. He was not the first European to reach China (see Europeans in Medieval China), but he was the first to leave a detailed chronicle of his experience. Europe 1349. The Black Death has ravaged for a few years now. The people of Europe nonetheless try to live their lives as normally as possible. The craftsmen still produce their goods and the traders still sell them for the best prices possible, while the swindlers, thieves and raiders still grab whatever they can. In the end, however, the grave robbers might be the ones who profit the most because it doesn't seem like the plague will retire any time soon. Rattus: Mercatus includes twelve new class cards featuring the characters mentioned above and others. These characters allow you to collect goods and use money to perform special actions. Strange things are going on in Europe. People are disappearing and followers are changing faction. The plague appears to be stronger in some countries, but nobody really knows why. At least people are warned and new alliances are made. Let’s bring an end to this plague! This is a mini-expansion. Rattus (base game) is required to play. For the Tamerlane card, Rattus Africanus (expansion) is required to play. The Rattus Bonus 2 (also known as Rattus: Essen 2011 Bonus Cards ) contains 4 additional character cards: Saladin (Chivalry) Aladdin (Islamic) Bedouin (Peasantry) Sinbad (Islamic) NOTE: Rattus (the base game) and the Rattus: Africanus expansion are required in order to play with these four new character cards. They can also be combined with the character cards from Rattus: Pied Piper and any other promotional character cards. The Christmas tree is a décor token. You may place it in a room consisting of two or three cards (not including the garage). You can have only one Christmas tree in your home. The standard décor rules apply otherwise. To get a Christmas tree, after you take the pair of cards from the column of your choice, discard the resource card and replace it with the available Christmas tree token with the most points. Würfelland , a.k.a. Diceland , is a racing dice game in which nothing has to be calculated. Every plays each turn based on the same roll of the dice, with all players racing to be the first to reach nine treasure fields and complete a territory of one chosen color. The game includes four double-sided wipeable playing boards for variety. Only a dirty pig is a happy pig! In Drecksau , each player has 3-5 clean pigs in front of him and three cards in hand. Each turn one card is played. By playing a mud card, one pig can be sent into the mud. The pig card is flipped over to show a dirty pig on the back. Rain cards clean all pigs, even your own! Barn cards protect pigs from the rain, while lightning cards destroy barns – but lightning rod cards protect barns from lightning cards. Farmer cards can be sent to dirty pigs: the farmer likes clean pigs... Pigs in a barn that are protected with a lock card are safe from the farmer. The first player who has dirtied all of his pigs wins! Rattus: Arabian Traders , a mini-expansion that requires both Rattus and Rattus: Mercatus , includes four new class cards. If you add in the Rattus: Africanus expansion as well, you can play with up to six players and use the new Islamic class cards. Hong , named after a two-headed dragon in Chinese mythology, is a tile-laying game of asymmetrical goals for two players. In a mystic land far away an empire is attacked by a fearless dragon master who is trying to conquer the empire by sending two headed dragons (Hongs) to defeat the emperor. As long as the dragons don’t come in big numbers the emperor will be able defend it, but the dragon master knows that a lot of small dragons can be the doom of the empire. Can the emperor save his land or will the dragon master flood the empire with dragons? This edition of Hong from White Goblin Games keeps the gameplay of the original design while including a double-sided game board (Castle and Garden), a mini-expansion (Lair of the Seven Great Dragons), and all-new artwork. Wat'n dat!? – also known as Kiproko – is a game about guessing words, but you can't use a pencil or other drawing material, and you can't speak or make gestures! All you have at your disposal are a few glass beads and some sticks. Under the pressure of a timer, you have to create as many words as you can with these materials. It's up to your teammates to guess and score points for your team! Qwixx gemixxt consists of two new blocks of scoresheets for use with Qwixx . The rules of the game remain the same — with players trying to mark off as many numbers as possible from left to right — but one pad has the colors split across the rows of numbers while the other pad has the numbers in non-numerical order. Heresy! Qwixx: Characters is a mini-expansion for Qwixx that consists of five character tiles, each with a special power. Maybe you'll get to change a missed turn into a marked space, or go back and fill a missed space, or use the white die twice. This mini-expansion contains 6 cards and can be considered a "Survival Kit" for the Humans in the game. The cards in "Panic Station: Survival Kit mini-expansion" are: 2 Night Goggles: This allows players to search an already searched room (one time use) without a Parasite spawning. 2 Parasite Signals: This allows a player to lure a Parasite away from a location where it would otherwise land. This would normally be used to ensure that Parasites do not land in a space with Humans. Of course, if this item is in the hands of the Host or an infected player, it can be used a little more devlishly. 1 Sniper Rifle: This ranged weapon allows players to target Parasites and Players up to 2 rooms away, and thus it is a very powerful weapon to defend yourself or attack another without the need to move to a more dangerous location. 1 Antidote: this is a one-time use injection. If this card is traded to an infected player, the player will be cured of the infection and be turned back to Human. This can be very dramatic, since it can give a human team on the brink of defeat a way to fight back.